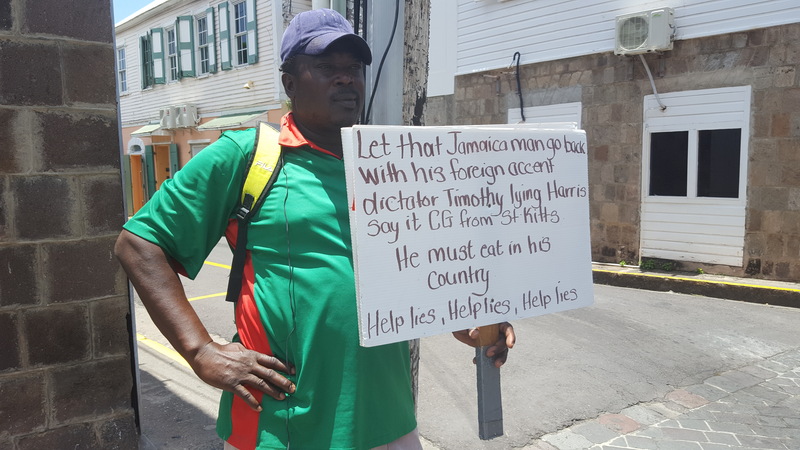 BASSETERRE, St.Kitts– Well-known protestor Curtis Crooke is back on the streets of the island’s capital of Basseterre protesting against the Team Unity Government headed by Prime Minister and Minister of National Security Dr. Timothy Harris. On the afternoon of Thursday 27th July, this reporters spoke with him as he stood on the opposite side of Church Street facing Government Headquarters holding a placard. When asked what his sign is about, Crooke lashed out at Dr. Harris for criticising St.Kitts-Nevis national former Police Commissioner Celvin ‘CG’ Walwyn whilst indicating that he (Crooke) has a concern about Major General Stewart Saunders of Jamaica being appointed as the Advisor in the Ministry of National Security. Crooke said his day one of his fresh protest action was on Monday 24th July. Yesterday was his second outing. When asked about what protesting means to him, he highlighted that it is a way to get messages out publicly.